With the trailer for Gods of Egypt (2016) dropping today, it seems like the old debate over white-washing of ancient cultures (that is, replacing the races of people in historical films with famous Caucasian actors) is cropping up again. Honestly, apart from the cool theme (we love our ancient myth in the Fox Tale Games studio) the movie looks like a colour-by-numbers action film that promises a completely unrealistic adaptation of ancient myth. And there’s nothing at all wrong with that! It’s going to be fun, hopefully colourful, and not at all related to historical (or mythological) fact! Whether Ancient Egyptian characters in an historical film ought or ought not to be played by Caucasian actors is really not central to this movie. The movie is more fantasy than historical re-enactment, and doesn’t hold itself out to be any more historically accurate than Monty Python recreating the Crusades. If it were, it probably wouldn’t have larger-than-human men and women sheathing themselves in metallic, animal-formed Iron Man suits and crashing into each other. If it were, it wouldn’t have Set enslaving the Egyptians to build giant monuments (as a side note, Egyptologists generally believe that those monuments such as the Pyramids of Giza were built by a working class rather than slave labour). One of our goals in creating Tempest: Shards of the Gods was to mix mythology and history to bring fantastical elements to agreed historical facts. At every stage, we have engaged with academics to try and get the most realistic depiction of ancient myth possible. In the trailer above, we see Horus and Set battling for the future of Egypt (plus a couple short shots of Thoth and Hathor) in magical mechasuits of some kind. Tempest aims to be a little more grounded. So while the Core set of cards will include Anubis, a few anthropomorphised canopic “Sons of Horus”, and embalmed spearmen rising from the grave, it will also include a Temple Shard of “Valley of Ancient Kings” (modeled off of the Valley of the Kings of course) which will include simple Egyptian spearmen, and a “Barren Sands” Battleground Shard which focuses on Charioteers as a Ranged combat Troop. In the lead-up to our January Kickstarter, we are commissioning and completing all of the art necessary for the Egyptian and Norse factions, to give every backer immediate access to a “print-and-play” version of the game with fully illustrated cards. It’s an exciting time (working with artists is always so inspiring!) and we thought we would share one of the pieces that just came in – perfectly timed with the Gods of Egypt trailer! We are informed by many an historian that the closest modern “look” to Ancient Egyptians is that of modern day Syria. As one of our historians pointed out, white-washing of Egyptian culture might not be far from the truth: pale skin was seen as a sign of nobility, probably because it was a symbol that they didn’t toil in the sun all day. Our artists may have put a few embellishments in (as fits the fantastical setting of a post-apocalyptic mythological world) but the soldiers of the Egyptian culture look as close as we can get them to those who lived 2000-5000 years ago! 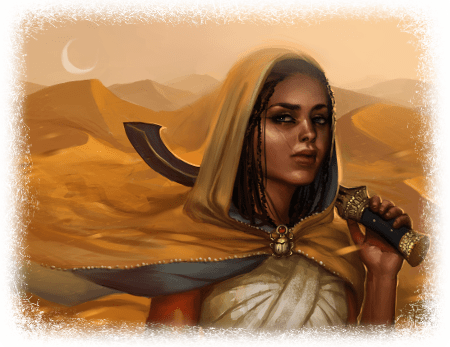 This beautiful illustration is for the card “Cloak of the Sands”. In game, it is an Upgrade card that boosts the equipped Troop when it is in the same Shard as a Structure you control. This fantastic piece of art was done by Dee McLoughlin, and you can find more of her work here. While it is not strictly historically accurate that women and men fought in historical wars, we have tried to share gender balance between the Troops equally too. The struggles of Tempest encompass the whole of civilisation after all! Nobody can be left at home when the gods fight. Nine weeks to go until the Kickstarter! If you aren’t already following us on Facebook, Instagram and Twitter, we recommend that you do so! We have plenty of content on each of those that you can’t see anywhere else. Or shoot us an email at info@foxtalegames.com to join our mailing list and get notified whenever we put something new up (and some exclusive previews too)! If you want to get involved (either playtesting or running a tournament), send us an email and we can set you up with a playtest pack and some prize support! ← Off to PAX Australia!